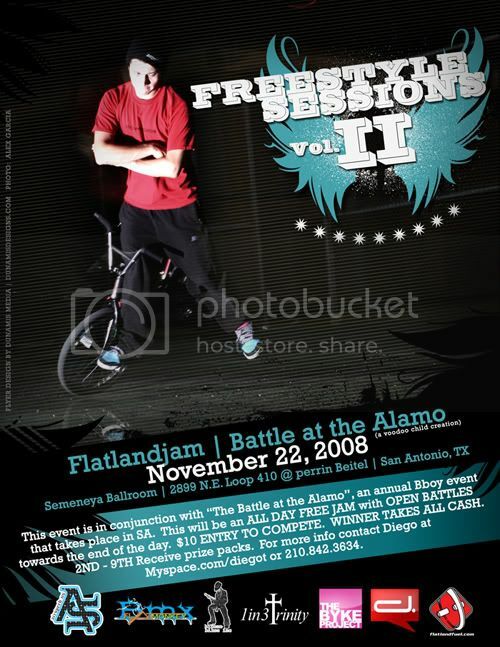 This will be an all day free jam....then those who are down for a battle...there will be an open battle towards the end of the day: $10 entry fee...winner takes all the cash...2nd-9th will receive prize packs....We are working on making this a yearly battle...if all goes well the winner will receive a title belt! In hopes you will return next year to defend your title! P.S. There is also going to be a break dancing contest as well! We might as well throw something at the OG around that time too!! Right on Mark...we are working hard to make this happen...I am down with a session at the OG again...I will have my Hitman together this week with a lot of lighter parts...so get ready bro! I'm definately coming up for this! Is the venue indoors? Diego told me last night it is outdoors and he is checking the area real well. We may be building a flat wood floor like Red Bull does for it. All in all Diego said he will ensure the area will be great for riding. Diego's last joint was amazing. I can't wait! I'll Be there too. Sounds like another good time. Many Thanks in Advance for y'alls efforts!!! THE BYKE PROJECT - Giving back through BMX. Here's the official flyer for the event. We just finished it up today. Word. I LOVE San Antonio's flat scene. If anyone from the South Houston Texas area is going to this Jam and making it a one day trip, get ahold of me....My wife is working and I am having car trouble. I will help with the petro...... Get in touch with me on my e-mail address. (gtcesflat@yahoo.com) If your going and coming back that same day, hit me up. The flyer is f*ckin AWESOME. Okay who is going to make it out? I am so pumped up to see everyone riding. You can count me in and Caleb!! I don't think I'll make this one. It's too chilly out to ride.